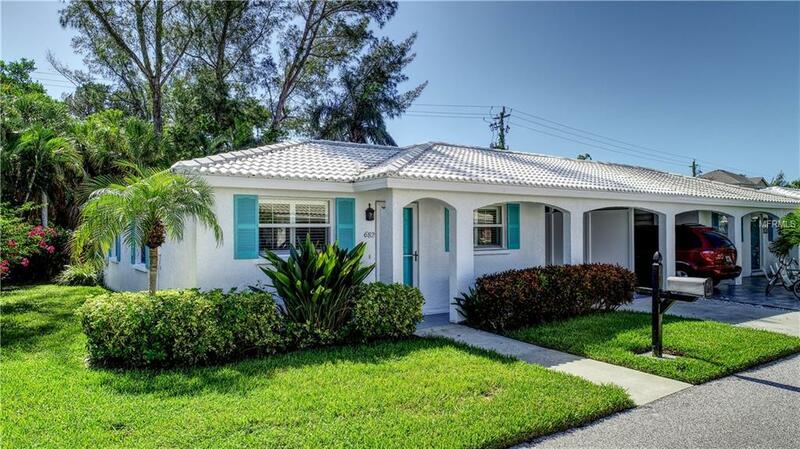 Check out this delightfully sweet & spacious, updated villa in Spanish Main Yacht Club! Bring your boat! Move-in ready, turnkey furnished, ultra-clean & freshly painted inside and out. Updated kitchen boasts quartz counter tops, newer stainless appliances, & the bead board cabinets lend a cottage feel. Highlights are beautiful tile flooring, 2014 tile roof, newer hurricane windows, updated bathrooms, and tasteful furnishings. The enclosed lanai adds extra living space, including a "bonus room" off of the Master Suite which is currently being used as an office. Large walk-in closet in Master. Inside laundry as well! Loads of storage with a generous storage room & storage cabinets in the carport. Enjoy grilling & chilling on the (Trex wood-look durable composite) deck in your very private lush backyard. Bring your hammock to relax and do some bird-watching! Bring your kayak & paddleboard too! The bay's gentle waters are perfect for water enthusiasts, boaters & fishermen alike. At the end of the day, a short walk to the deeded Gulf beach access, will reward you with breath-taking sunsets. Spanish Main is a friendly, active community with a pool, a large marina which accommodates vessels as large as 45 feet, direct access to the inter-coastal waterways & a 4 mile boat ride to the Gulf waters!! Pet-friendly, reasonable fees & the living is easy! Come see!